Infolinks Review: The best alternative of Google Adsense for earning great income through website!! There are a lot of ways by which one can make money online from his website. However, there are still many bloggers out there who are struggling to earn a decent amount through their blogs despite of putting much effort. The reasons behind this are many, but the most obvious reason is most bloggers don’t know which method of earning they should follow. If you are also one of those people who are running an online business which doesn’t seem to earn much, then this article is just for you. When it comes to monetize through a website or blog, providing advertisement is considered as the most suitable way. There are many services on the web who offers an effective way to earning a good income through advertisement. The most widely used is Google Adsense, where you are required to submit an application for your blog and after they approve, Adsense will provide ads on your website and you will be able to earn brilliant money within few weeks. However, it is easier said than done as it is incredibly difficult to get approval from Adsense. It has been reported that more than 30% of applications are rejected by Google Adsense. This is the main reason why people continue to look for a suitable alternative for Adsense, which offers brilliant payment, worthy features and approve their application within a couple of days. Infolinks is one such alternative of Adsense that has been used by millions of people worldwide. It is known as the best income source for bloggers who have tried Google Adsense and got rejected. 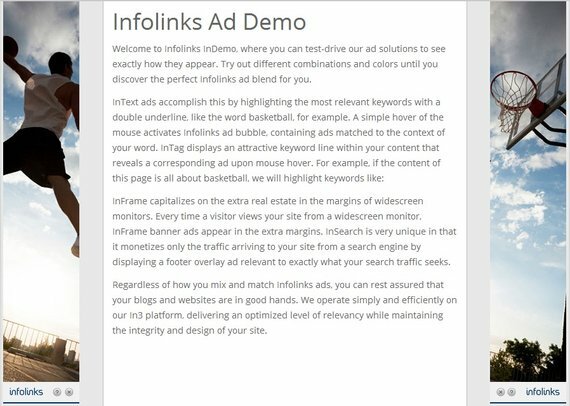 Similar to Adsense, Infolinks is also a Pay Per Click advertising platform that assists website owners to earn some extra earning. Infolinks is a pay per click service provider started in 2007 and since then, it has helped thousands of to make some great money through their website. It contains a lot of features like Google Adsense in addition with some more benefits of its own. Other than the fact that getting approval from Infolinks is a piece of cake, it also provides different types of advertisement such as in-text, in-frame and much more. More people are associating with Infolinks these days as they are finding Google Adsense approval pretty difficult due to strict terms. Infolinks uses the related keywords from the website to showcase similar ads. These in-text will appear to be the same as normal kinds of links on the website, thus will result in more click, which will eventually give you more cash. The higher number of clicks and views you will get, the more money you will be able to make from Infolinks. This is as simple as that. How to get started with Infolinks? In order to get started with Infolinks, all you need to do is create a publisher account on Infolinks, which is very simple. Sign up as a publisher and enter your personal details such as name, address, email address, website name, etc. After sign up, it will take a max of a couple of days from Infolinks to approve your application and once you get the approval, you can start inserting ads in your page. If you are using a WordPress blog, then inserting ads is quite easy as it can be done with the help of plugins. You can use the Infolinks official plugin from the WordPress plugin directory to easily integrate Infolinks ads in your blog. You don’t need to manually place the ads on your website through Java script code just like Google Adsense. All you need to do is add the code into your website and the rest will be taken care by the automated system. Unlike Adsense, there aren’t any special requirements necessary, such as high traffic on the website to get your application approved by Infolinks. You just need to have a genuine website with decent content and traffic to get a publisher account. Once everything is done, you can see Infolinks ad on your blog within five minutes. How to customize Infolinks ads to earn more money? If you want, you can also customize your Infolinks ads to a great extent and increase your income. Below are given some of the ways by which you can customize your ads and implement them in order to get more income. Ads with single underline: You can highlight your ads with a single or double underline. According to experts, ads with single underline in in-text ads look more normal and possibility of a user clicking on the link is much higher if placed within your website content. Ad blindness: in order to make sure your ad link appear as normal as web content, you can customize the color of the in-text ads as well. Mostly, the website links are displayed in blue color and thus you can use your text of the same color to match the normal links. This way, the readers won’t be able to differentiate between the normal links and advertisement link and most probably click on your ad link due to brilliant placement, which will eventually increase your Infolinks income. Using high paying keywords: You can also earn more by using high paying keywords as per the website niche. You can find you the keywords related to the topic with the help of Google Adwords Keyword Tool. Use those keywords in your website content and you will get better earning for sure. But before placing those keywords, make sure you are using only the relevant keywords so it doesn’t affect the readability of the article. Switch Infolinks ads On/Off: You can also turn On/Off Infolinks on several pages or section of the website. You can turn off the ads on website sidebars and use the same area for banners and links of monetization. Infolinks Support: if you are having any difficulty regarding the ad integration or any other issue, the support system of Infolinks is available 24*7. You can mail them or call them for any query. Or you can simply go to their FAQ section where you most probably find your answer. Payment System: There are many sources by which you can transfer your payment. These include PayPal, Bank Wire, ACH (available for US citizens only) and Payoneer. The minimum payment amount is hardly $50, except for Bank Wire and ACH, which has a higher minimum payout. In case if you don’t achieve the minimum amount by the month, you amount will automatically be added to your next months earnings. 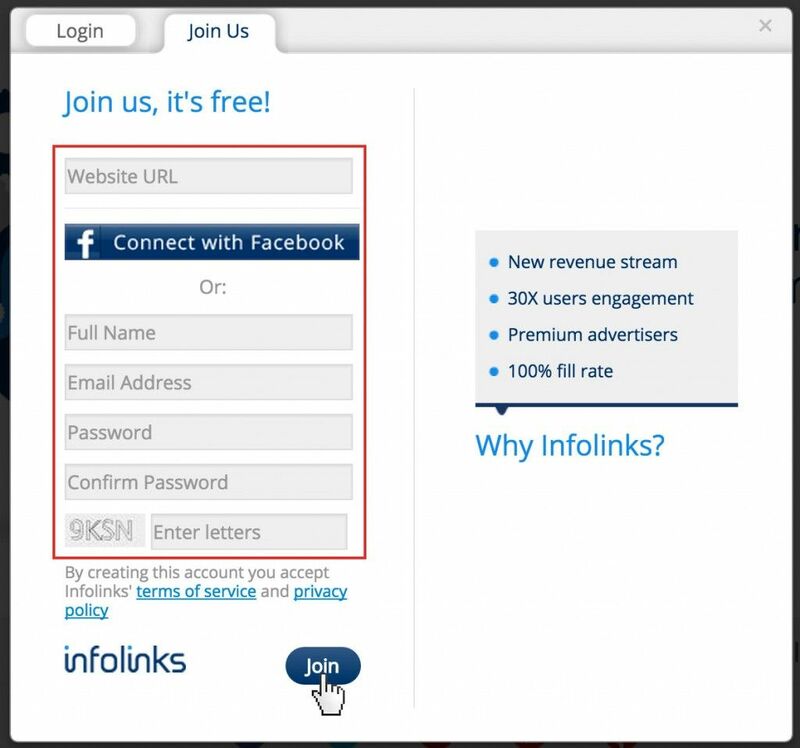 The revenue ratio of Infolinks is 70:30, which is higher than any other reputed advertising company in the market. Earning reports: With Infolinks, you can keep track of your earnings for the day, week, and month and for the year. Furthermore, you can also keep track of vital statistics related to the CTR, eCPM and impression counts. In-text ads – These kinds of ads appear in the textual content of the website where some keywords of the website will be converted into normal looking links. In-frame ads – These ads appear on the large screen to read your content. These are very popular these days as it also shows images related to the relevant keywords. In-tag ads – These are similar to normal link ads, but appear as a tag with related keywords in the website. You can customize these ads according to your website design and display a collection of tags in the page. In-search ads – This type of ads will assist you in increasing search engine traffic and will have no impact on your regular visitors. It can also lower down your bounce rate and increase your website overall SEO. Being so advantageous, no wonder people are turning to Infolinks rather than any other advertisement company for their website or blog. Even though the earning is little less the Google Adsense, it provides many more outstanding features that is enough to prove its worthiness. You are not required to manually place those ads as Infolinks will take care of it on its own. Now there won’t be any long days wait for the approval of ads. Now, increase your website’s traffic with one of the most widely used pay per click services and also earn a great deal of money. Top 6 WordPress Themes for Building Your App’s Landing Page! What is Contentmart and What does it offer? Partnership with Google AdSense Certified Partners? Good or Bad? Great Review, but I have few questions in my mind after reading this. I want to know, whether Infolinks is good for small blogs or sites having visitors around 4-5k monthly? Will it work converting those visitors into some secondary income or I am also thinking about using CPA network? Which should I use for best secondary income? CPA or InfoLinks? 1) Ya, if you don’t have Adsense, then you can try Infolinks for 4-5k monthly visitors! 2) Success in CPA depends upon the type of articles, how you write! You should have skills to convert your visitors into buyers by writing in convincing style! So no comparison between CPA Network and Infolinks! Earnings are always depended upon our traffic! So how much traffic you are getting now? Hello, can we use both adsense and infolinks in same blog/website ? Yes infolink is a good program to earn money from your blog thanks for sharing thee nice tips with us.